Hofstra's Annual Relay for Life Breaks Fundraising Goal! This year’s annual Relay for Life was another incredible success! More than 900 members of the Hofstra community divided up into 74 teams came out to the soccer intramural field on Saturday evening to spend the night (7 PM to 7 AM) walking to raise money for the American Cancer Society. The goal set for the evening was to raise $110,000, up almost $5,000 from what was raised last year. We are proud to announce that the Hofstra community not only met their goal, but exceeded it! In total, we raised $111,000! Congratulations! All year the Relay for Life student committee, spearheaded by tri-chairs Rob Canobbio, Alyssa Legnetti and Kimberly Wilkens, worked to not only encourage participants to raise money for an important cause but to put together an event that honored all those who have been impacted by cancer: survivors, caregivers, and those whom are currently fighting and those whom have lost their battle with cancer. During both the opening and luminaria ceremonies members of the Hofstra community shared their personal stories about how their lives have been impacted by cancer. Their bravery and their stories touched everyone in attendance, especially those whom have struggled with cancer in one way or another themselves. For the evening, we were all one big Hofstra family supporting one another. The luminaria ceremony was especially moving. Members of the Hofstra community were able to buy a luminaria bag in remembrance of someone whom they lost to cancer. During the ceremony everyone walked a lap in silence as those who bought a luminaria lit their bag. The entire field was lit up in remembrance of everyone we came together to remember. We stay-up all night and walk because cancer never sleeps. If you were unable to attend the walk this year, mark your calendars for Saturday, April 26, 2014 as the date for next year’s Relay for Life has already been set! Again, congratulations to everyone who participated in this year’s Relay! This past Saturday at 10 a.m. members from Delta Chi Fraternity and Pi Kappa Alpha Fraternity volunteered their time and efforts to clean up the Cameron Estates in Hempstead. The students helped community civic leaders and residents clean up the Hempstead neighborhood. All had a good time while they worked side by side to rid the streets of trash and debris. The community members and students were equally grateful for the experience. 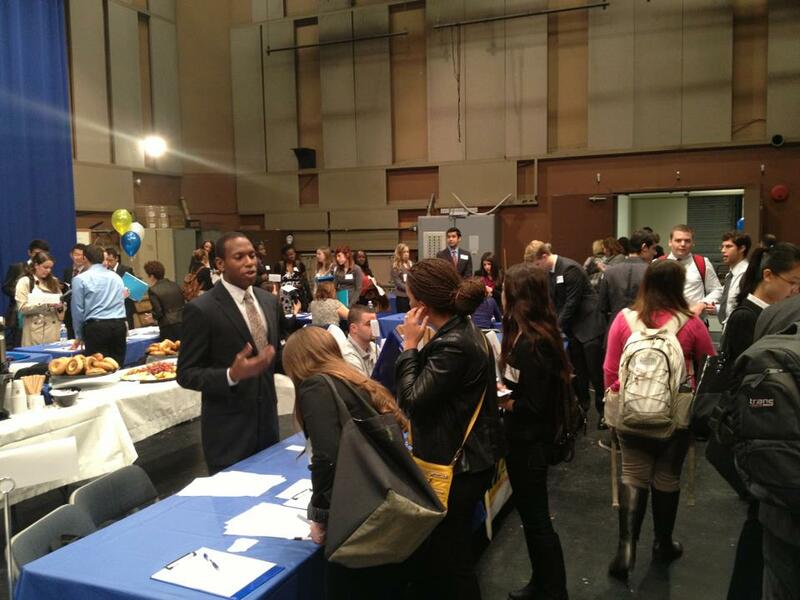 The Spring Career Fair is TODAY! The Spring Career Fair is TODAY in the David S. Mack Sports and Exhibition Complex from 11am-2pm! Here are some last minute tips to help ensure you get the most out of it! Come dressed professionally. No sneakers, sandals or jeans! Bring a few copies of your resume printed on resume paper. Be sure to proof read your resume before printing it out! Have a game plan. Click here to see a list of participating employers and decide who you want to talk to before you go. First impressions are everything. When meeting employers, make sure you smile, make eye-contact and give a firm handshake. Remember, be confident! Prepare a brief introduction about yourself for when you meet employers. You can talk about your education, related coursework and work experiences, ask what types of positions are available, and why you want to work for that company. Remember to bring a pen and paper to take notes. The thoughts, support, and prayers of all of us at Hofstra are with everyone affected by the recent events in the greater Boston area. There is no doubt that each one of us has a connection to someone living, working or studying in this region and I know it has been hard to watch as their lives have been disrupted throughout the past few days. It is my hope and prayer that those close to you are safe. Student Counseling Services: Please call (516) 463-6791. If you are experiencing a psychological emergency during non-business hours, please contact Hofstra's Public Safety office at (516) 463-6789, and they will put you in contact with a crisis counselor immediately. More information can be found here. Residential Programs Staff: If you are a residential student, you are encouraged to speak with your Resident Director or your Resident Assistant who can assist in connecting you to supportive campus resources. Off-Campus Living and Commuting Student Services Staff: If you are a student living off campus please do not hesitate to contact Anita Ellis, Director for Off-Campus Living and Commuting Student Services at Anita.Ellis@hofstra.edu, who can also assist in connecting you to supportive campus resources. In addition, of course, please don't hesitate to contact the Student Affairs office at 516-463-6933 or at studentaffairs@hofstra.edu. More importantly, this is a time when by reaching out to one another, we can find the strength to understand and grow as a community. On Wednesday, April 17th the Office of Off-Campus Living and Commuting Student Services hosted a resources fair dedicated to students who live off-campus. Students were able to learn how to be a good neighbor, prepare their homes for warmer weather and obtain valuable information from renters insurance to leases. Close to 50 students came out making the event a huge success. Thank you to all of the students for attending as well as the Hempstead Police Department for presenting information on social host law. 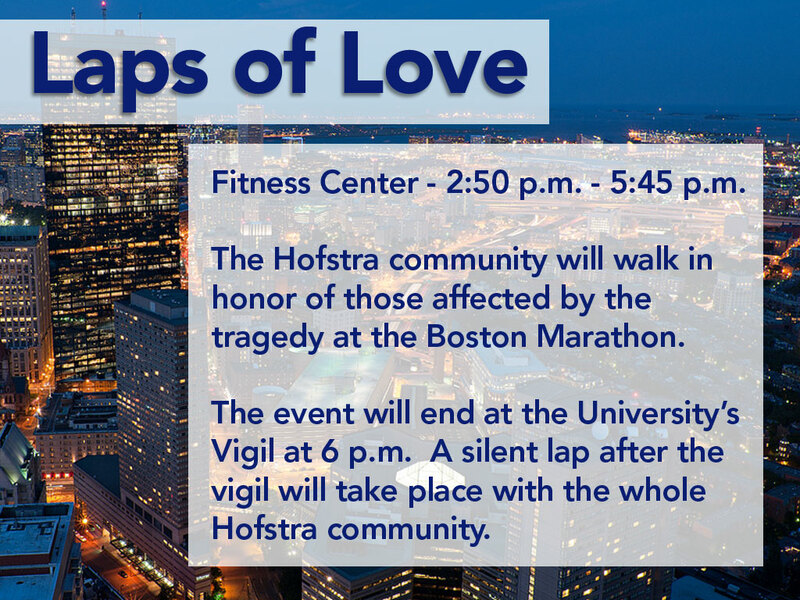 Today, Thursday, April 18, the event will allow the Hofstra community to visit the Fitness Center from 2:50pm-5:45pm and walk or run laps on the track in honor of all victims, and record your laps that will be tallied up to represent your contribution towards the cause. 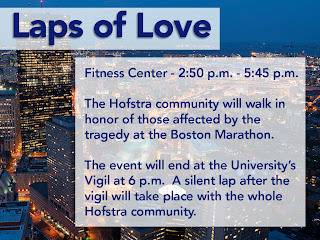 In addition, and at the conclusion of LAPS OF LOVE, all participants are encouraged to attend the candlelight vigil at Hofstra Hall at 6:00pm. Please join us as the vigil will also be open to all of those who do not wish to walk or run laps earlier in the day. Following the vigil ceremony, there will be one final silent Lap Of Love around the quad. The Hofstra University community is deeply saddened by the recent tragedy that occurred in Boston during the Boston Marathon. As a community, we mourn for those who died or were injured in the senseless violence. 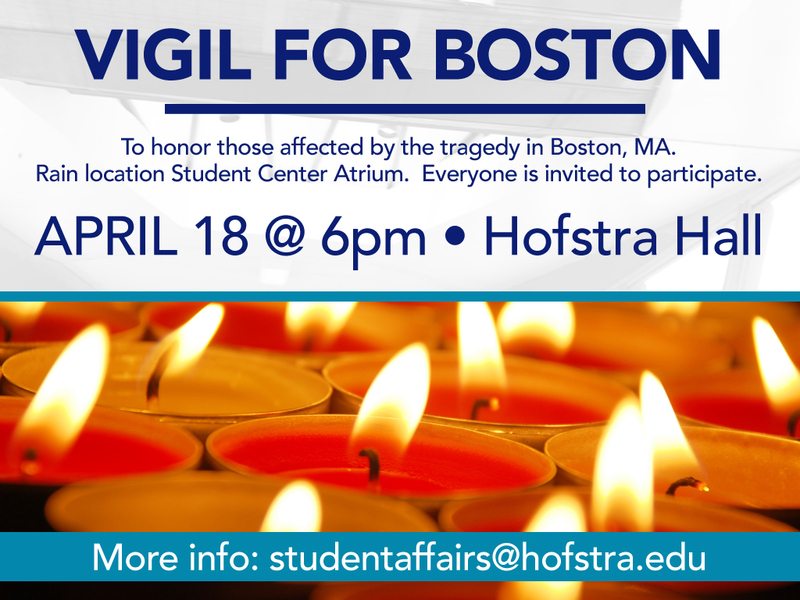 The division of student affairs, along with our students, is hosting a vigil tomorrow, Thursday, April 18 at 6 p.m. outside Hofstra Hall to honor all those affected by this tragedy. The rain location will be the Student Center Atrium. Everyone is invited to participate. Student Counseling Services: Counselors are available by appointment, please call (516) 463-6791. If you are experiencing a psychological emergency during non-business hours, please contact Hofstra's Public Safety office at (516) 463-6789, and they will put you in contact with a crisis counselor immediately. 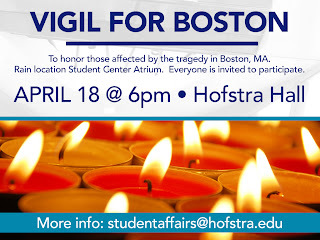 Staff from the Student Counseling Services will be present at the vigil. More information can be found here. Residential Programs Staff: If you are a residential student, you are encouraged to speak with your Resident Director or Resident Assistant should you need someone to talk to or connect you to other resources. Off-Campus Living and Commuting Student Services Staff: If you are a commuter student please do not hesitate to contact Anita Ellis, Director for Off-Campus Living and Commuting Student Services at Anita.Ellis@hofstra.edu, who can also assist in connecting you to supportive campus resources. And of course, please don't hesitate to contact the Student Affairs office at 516-463-6933 or at studentaffairs@hofstra.edu if we can assist you in any way. Our thoughts and prayers are with all of those affected and with the entire Boston community. Jump-start your spring job fair preparation with The Career Center and enjoy a free cup of Starbucks coffee or iced tea. The first 200 students to attend will receive a Hofstra interview portfolio! Our staff can’t wait to meet you! For more information, call The Career Center at 516-463-6060 or email us at careercenter@hofstra.edu. The Common hour offered delicious food, music, Chinese traditional and modern dance, and the inspirational words of Dr. Jin. Y. Shin: yes, the Office of Multicultural and International Student Programs hosted the Asian / Pacific Islander Heritage Month Reception! Sonia Fernandes, Assistant Director, welcomed the students, staff, and faculty that gathered to enjoy the reception’s programs. She then introduced one of Hofstra’s Chinese students and first-year graduate student in Finance, Jia Lan, who performed a Chinese classical dance. In her traditional costume of various shades of pink, Lan graciously flowed and smiled at all times, entrancing the audience with her carefully choreographed movements. Dr. Jin. Y. Shin, the keynote speaker, followed. Dr. Shin is an Associate Professor at the Department of Psychology at Hofstra University and she is originally from Pusan, Korea. She moved to Peoria, Illinois, to study English at Bradley University in 1988 and completed her Ph.D. in Developmental Psychology at the University of Illinois at Chicago in 1999. Her dissertation was a cross-cultural study of the social support available to mothers in Korea and the U.S. as they coped with the demands of rearing children with intellectual disabilities. Dr. Shin was a post-doctoral fellow at the Institute for Health Services Research and Policy Studies of Northwestern University and the Rehabilitation Institute of Chicago, where she conducted pediatric outcome research for children with disabilities. Dr. Shin continues to evaluate the effectiveness of home-visit early intervention programs for children with intellectual disabilities in Vietnam, to promote research and clinical work and advancing the field of disability and rehabilitation in Asia, and to focus on bullying issues of Korean-American children in greater New York Areas. As a professor and former international student, Dr. Shin had a lot to offer to the international and local students of Hofstra University. After getting a feel for who her student audience was, Dr. Shin used two images –a insect and a frog –to explain to the students her initial desire to blend in and her failure to do so because of her cultural background. Hidden in these words was her lesson to accept one’s identity without trying to “blend in” into the mainstream culture. She also shared that she grew up in a Korean family where she was permitted to always have a voice and how, in spite of her personality, she could not express herself well when she arrived in Peoria, Illinois. The latter is a common challenge that international students experience: in spite of being very vocal in their cultural contexts, difficulties with the English language can hinder the students’ ability to communicate and socialize. Not to mention the homesickness and the lack of food (Dr. Shin greatly missed her spicy Korean food at Peoria)! Because of small number of Asian students, Dr. Shin felt both special and challenged, sometimes driven to the point of tears. She was happy to improve her English and when she transitioned to Chicago, she experienced another common shock to college students: being in a larger institution can often set the stage for feeling anonymous and invisible. So what mattered in the end? Not only did Dr. Shin offer advice on learning, adapting to change, transitions in college, and one’s identity, but she also underlined the relevance of mentors and advisors, of programs and services (e.g., the Writing Center; the Counseling Center), having hobbies, and creating a safety zone for one’s cultural identity. Cong Ma, Jia Lan, and Yuxi Ouyang dance to the beat! With so much going on at Hofstra during the spring semester, students have many opportunities to get involved and see what Hofstra is all about...and why it's so great to be a student here! The Office of Student Leadership and Activities definitely doesn't disappoint when it comes to programming; just check out what we've been up to! ...over 125 students attended our First Friday: Women's HERstory Edition event?! That's our biggest First Friday turn out ever! ...we had 6 days of Safe Spring Break events, and gave away 8 L.L. Bean backpacks to participating students? ...juniors can sign up for a Awesometastic Scavenger Hunt in Manhattan for the chance to win an Amazon Kindle? ...we've had three Explore Next Door Trips so far this semester, and still have two more to come? Sign ups for our Museum of Modern Art trip begin TODAY at 11:30am in Room 260 of the Student Center, and sign ups for our Bronx Zoo trip begin on April 17th! ...we've had 4 karaoke nights so far as a part of our weekend programming initiative, and have three more to come? They will place April 12, 19, and 26 from 7:00 p.m. - 9:00 p.m. in HofUSA! Well, now you KNOW! There is never a dull moment at Hofstra, especially as the semester is coming to a close! Be sure to attend all of our great upcoming events and LIKE us on Facebook at www.facebook.com/HofstraOSLA to find out more! On March 8th representatives from both the student and staff populations gathered to attend a presentation entitled Step Up! It centered around knowing what it takes to be a difference maker in the world. 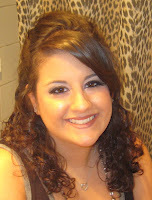 Hofstra University was very pleased to welcome back one of its former graduates who has gone on to do great things. Scott Goldman PhD of the University of Arizona brought his award winning program on Bystander Intervention and Prosocial Behavior to selected members of Division of Student Affairs. More importantly the event was attended by over 50 Hofstra students who volunteered their time because they believe in making a positive impact on the people around them. Dr. Goldman taught students and staff alike about some of the reasons why people choose to not get involved (fear of harm, assuming someone else will do something, lack of awareness) but also the value being the first to STEP UP and make a change for the better. Student feedback suggested that this was a good start but they would like to see the program expanded from here. The office of Student Counseling Services is looking to work hand in hand with students on creating a special version of Step Up that is tailored to the Hofstra University campus community and its unique set of challenges. Keep your eye out for advertisements on future programming or if you would like to be more directly involved you can call contact person Dr. Daniel Rinaldi from Student Counseling Services at 516 463 6791.